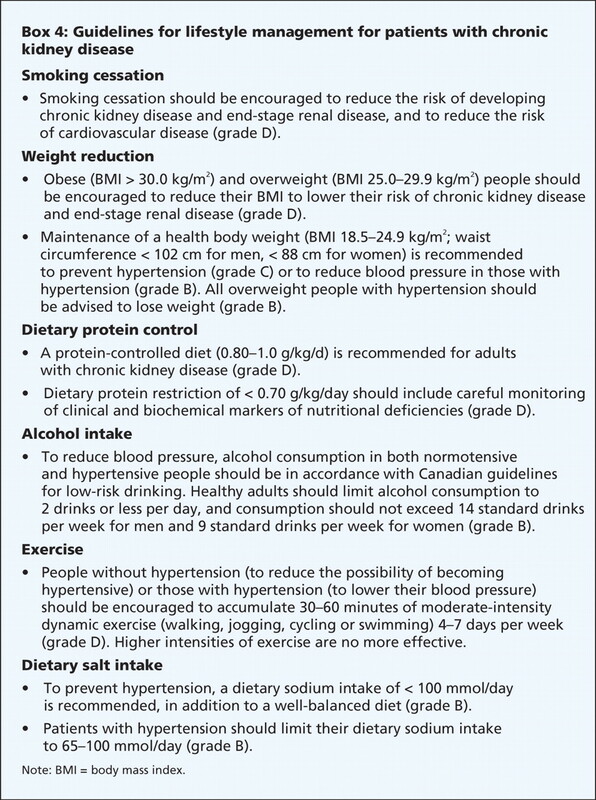 New guidelines for the management of chronic kidney disease have been developed by the Canadian Society of Nephrology (Appendix 1 contains the full-text guidelines; available at www.cmaj.ca/cgi/content/full/179/11/1154/DC1). These guidelines describe key aspects of the management of chronic kidney disease to facilitate shared care for these patients by general practitioners and specialists, including internists, endocrinologists, cardiologists and nephrologists. Specifically, these guidelines are for the care of patients who are not receiving dialysis. In this review, we outline recommendations from the guidelines on aspects of management of chronic kidney disease, including targets for various abnormalities, strategies for treatment and the frequency of follow-up based on the evidence available. Most patients with chronic kidney disease will die of events related to cardiovascular disease before end-stage renal disease develops.8 Therefore, an important focus of care for patients with chronic kidney disease includes management of cardiovascular risk factors. These guidelines are the first integrated publication to guide and optimize care for patients with chronic kidney disease. As part of a national strategy that incorporates chronic disease management, these guidelines serve as a starting point for ensuring optimal management of care for these patients. Guidelines, however, do not replace clinical judgment or the need for a nephrology consultation if questions arise. Clinical practice guidelines for the management of chronic kidney disease that does not require dialysis have been developed in the United Kingdom, Australia and the United States. The Canadian guidelines are unique because they include an in-depth evaluation of a broad range of topics in the management of chronic kidney disease, are based on the most recent evidence and are aimed at front-line physicians (both general practitioners and specialists). We initially divided the management of chronic kidney disease into key topic areas. We assigned each topic to nephrologists and content experts within the field (Appendix 2, available at www.cmaj.ca/cgi/content/full/179/11/1154/DC1) who performed a systematic review of the literature from which relevant recommendations were developed. The topics were chosen based on their importance in the management of chronic kidney disease, as well as the existence of an evidence base. In addition, we have included topics that do not have a substantial direct or indirect evidence base but are important for practitioners and patients (e.g., preparation for care of end-stage renal disease and comprehensive conservative management). Each recommendation was graded using the scheme developed by the Canadian Hypertension Education Program9 and used by the Canadian Society of Nephrology Guidelines Committee (Appendix 3, Appendix 4, available at www.cmaj.ca/cgi/content/full/179/11/1154/DC1).10 The criteria for grading these recommendations range from those reflecting highly valid, precise and applicable studies (grade A) to those based on lower level evidence and expert opinion (grade D). Grades B and C refer to studies of lesser degrees of validity, including surrogate outcomes or extrapolation of study results to other populations. The final draft of the guidelines was reviewed by experts and external stakeholders, including other relevant associations, to ensure consistency with other guidelines. We developed the clinical practice guidelines statements using best evidence where available. In cases where evidence did not exist, we provide the clinical practice recommendations along with the rationale. The full text of each discrete subject area is available online (Appendix 1, available at Appendix 3, www.cmaj.ca/cgi/content/full/179/11/1154/DC1) and includes the rationale for the statements, the evidence base and the relevant background. A summary of the guidelines is provided in Appendix 5 (available at www.cmaj.ca/cgi/content/full/179/11/1154/DC1). It is important to recognize that the major risk for patients with chronic kidney disease is death from cardiovascular disease or diabetic complications. As a consequence, we chose to align the guidelines with those from the Canadian Diabetes Association, the Canadian Hypertension Education Program, and the Canadian Cardiovascular Society. Guidance for primary care providers and specialists for the referral of patients with chronic kidney disease to nephrologists are available (www.csnscn.ca). Most cases of nonprogressive chronic kidney disease can be managed without referral to a nephrologist. Referral to a nephrologist is generally recommended for patients with acute kidney failure, persistent estimated glomerular filtration rate less than 30 mL/min/1.73 m2, progressive decline of kidney function, ratio of urine protein to creatinine greater than 100 mg/mmol (about 900 mg/24 h) or urine albumin to creatinine ratio greater than 60 mg/mmol (about 500 mg/24 h), inability to achieve treatment targets, or rapid changes in kidney function. Hypertension is commonly associated with chronic kidney disease. It develops in more than 75% of patients with chronic kidney disease at any stage.10 It is both a cause and a consequence of chronic kidney disease. This section of the guidelines highlights key aspects of the management of hypertension in patients with chronic kidney disease. These aspects include target blood pressure, initial drug therapy for proteinuric and nonproteinuric chronic kidney disease, and treatment of hypertension in association with diabetes and large-vessel renal vascular disease (Box 1). This section of the guidelines stress the importance of lifestyle management in the care for patients with impaired renal function. Because chronic kidney disease shares common risk factors with cardiovascular disease and diabetes, lifestyle modifications directed at smoking, obesity, alcohol consumption, exercise and diet are important (Box 4). Dietary protein intake has been the focus of several trials. However, there is a lack of convincing evidence that the long-term restriction of protein intake (< 0.70 g/kg/day) delays the progression of chronic kidney disease. Thus, a protein-controlled diet (0.80–1.0 g/kg/day) is recommended.29–31 There have been no studies about dietary salt restriction and development or progression of chronic kidney disease. However, the benefits of salt reduction as they pertain to the development and control of hypertension are available32,33 and are included in the guidelines. Anemia is prevalent among patients with an estimated glomerular filtration rate less than 60 mL/min/1.73 m2.48 Anemia is associated with adverse outcomes in patients with chronic kidney disease, including hospital admission, cardiovascular disease and mortality.49,50 Although erythropoietin deficiency is a well-known cause of anemia in this population, the guidelines recommend that other potential causes of anemia should be sought (eg., iron deficiency) and treated accordingly (Box 6). To date, therapies to normalize the hemoglobin level in these patients have not shown any health benefit. These therapies have been associated with an increased incidence of death or need for dialysis.51–53 Based on this evidence, a target hemoglobin level of 110 g/L is recommended for patients with chronic kidney disease (acceptable range 100–120 g/L). The use of erythropoiesis-stimulating agents for the treatment of anemia in patients with chronic kidney disease is associated with potential adverse outcomes, including increased blood pressure and thrombotic complications. They should be prescribed by a specialist with experience in prescribing these agents. Iron therapy is an important component of anemia management.54,55 We recommend that the oral form of iron be considered preferentially over the intravenous form. Renal excretory function plays an important role in maintaining the balance of calcium and phosphate. 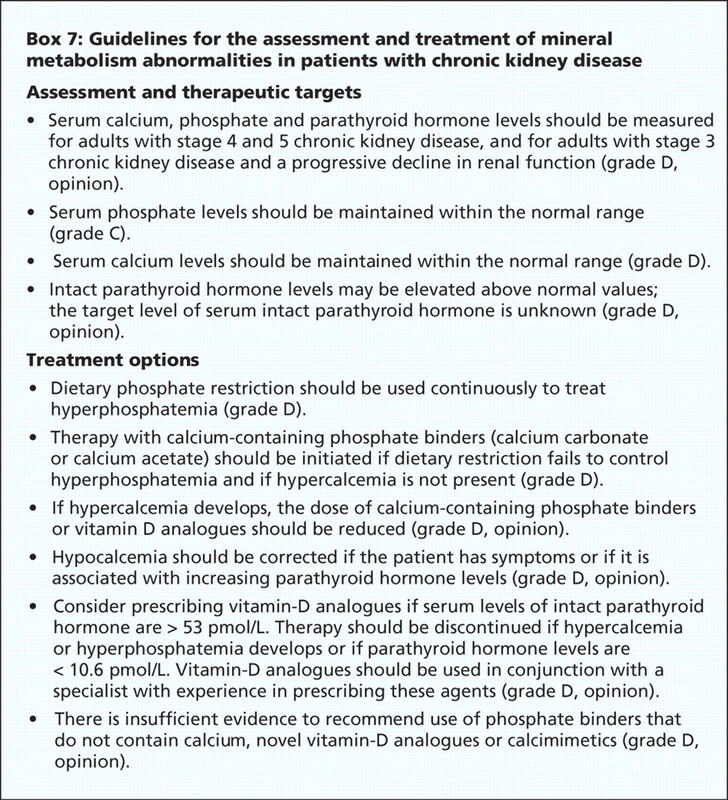 Because progressive chronic kidney disease results in the development of hyperphosphatemia and hypocalcemia, this section of the guidelines focuses on assessment and treatment of mineral abnormalities. These metabolic alterations may play a role in the pathophysiology of vascular calcification as well as bone disease. The potential for bone disease may be increased in the presence of acidosis, which may be treated with the use of oral bicarbonate. The kidney is also a site of the 1α-hydroxylation of 25-hydroxyvitamin D to its active form, 1,25-dihydroxyvitamin D (calcitriol). As renal function declines in chronic kidney disease, calcitriol deficiency promotes parathyroid gland hyperplasia and increased parathyroid hormone synthesis, ultimately leading to secondary hyperparathyroidism. Although the overall objectives of the guidelines and recommendations are to delay progression of both chronic kidney disease and its complications, a proportion of patients will require renal replacement therapy (either dialysis or transplantation) to extend their life. 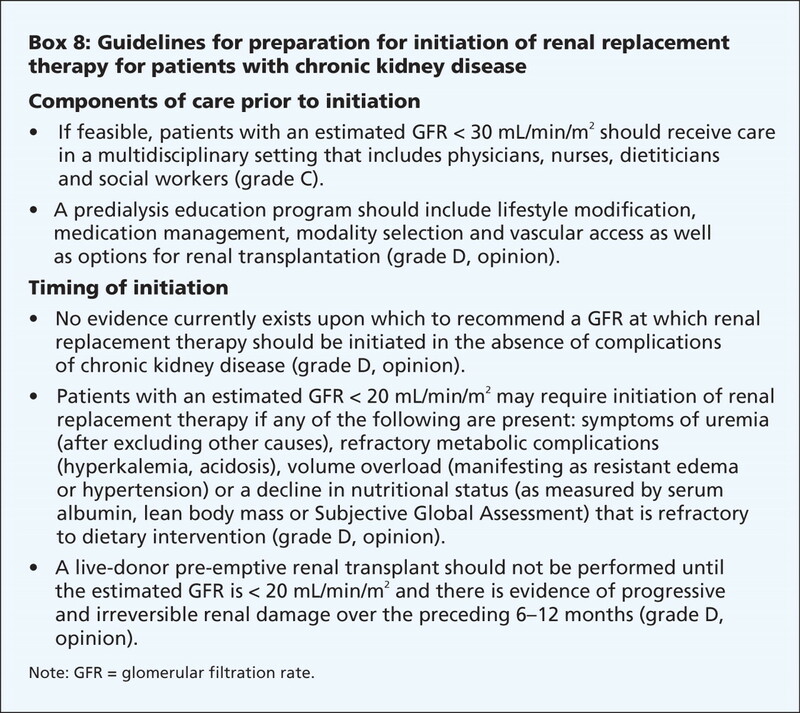 The purpose of this section of the guidelines is to delineate the aspects of education, care and processes that are necessary to optimize the preparation of these patients for renal replacement therapy (Box 8). Appendix 1 includes references with more complete information on this topic (available at www.cmaj.ca/cgi/content/full/179/11/1154/DC1). Physicians and health care providers must be aware of the need for preparation and the time that is required to implement these care plans. The care of patients with chronic kidney disease necessarily includes proactive comprehensive management for those who choose not to receive renal replacement therapy and for those who come to the end of their life after a period of time on a therapy. 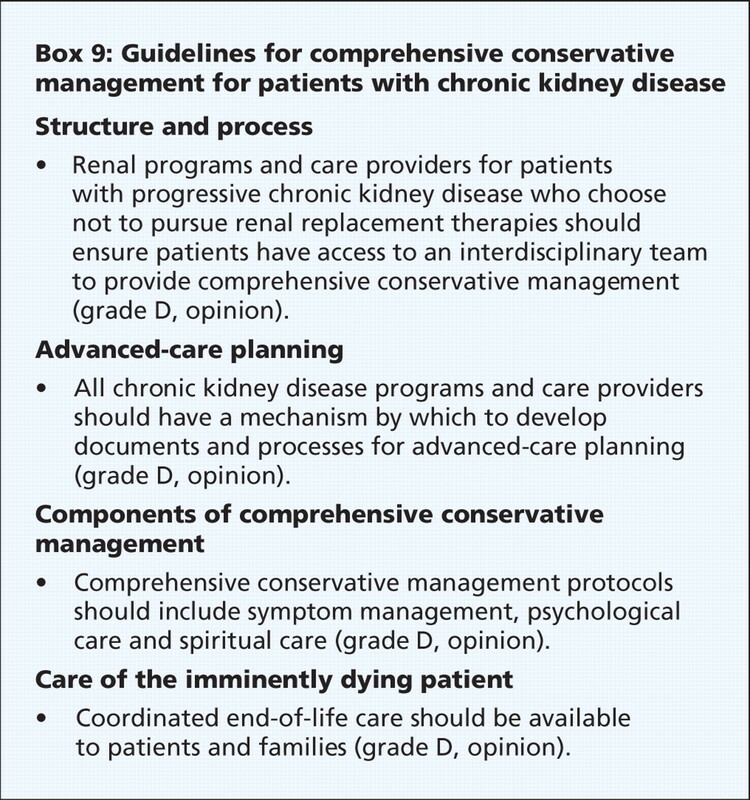 We describe the components and needs for comprehensive conservative management and end-of-life care for patients with chronic kidney disease (Box 9). We recognize that not all patients will have been referred to a nephrology team at the time that they declined renal replacement therapy, therefore, we have tried to be appropriately broad in these recommendations. At present, the best available evidence suggests that blood pressure and glycemic control will have the greatest impact on delaying the progression of both chronic kidney disease and cardiovascular disease. Nonetheless, the complexity of this condition clearly requires a better understanding of the absolute and relative value of identifying and treating the myriad clinical and laboratory abnormalities that occur in the context of reduced kidney function. Although individual retrospective or observational studies and basic research have generated data that support the importance of anemia and lipid and mineral metabolism abnormalities, it is critical that we better define the importance of these conditions for each stage of chronic kidney disease. Furthermore, we need to develop and evaluate risk scores for progression, such that resources can be appropriately directed to patients at greatest risk of progression and not to those who simply have reduced kidney function or evidence of kidney damage. We can identify patients at risk for chronic kidney disease who have cardiovascular disease, diabetes or belong to a specific ethnic group or have a family history of chronic kidney disease. We can ensure that patients with chronic kidney disease and any other risk factor for cardiovascular disease receive aggressive treatment, and that a sense of therapeutic nihilism does not overcome our judgment and clinical care. Most importantly, the lack of evidence should not foster further nihilism but rather encourage us to advocate for the design of and enrollment into randomized control trials that answer questions relevant to this population. Chronic kidney disease is common and is associated with increased cardiovascular risk. Attention to cardiovascular risk factors remains the cornerstone of care to delay progression of chronic kidney disease and prevent cardiovascular events. Randomized clinical trials are lacking; thus, recommendations in the guidelines are based on a synthesis of the best available evidence. Shared care of patients with chronic kidney disease by general practitioners and specialists is encouraged. Funding: The Canadian Society of Nephrology provided financial support for the publication and distribution of these guidelines. Contributors: All of the authors contributed to the conception and design of the guidelines and to the development of the guideline recommendations and statements. Adeera Levin and Brenda Hemmelgarn drafted the manuscript. All of the authors revised it for important intellectual content and approved the final version submitted for publication. Competing interests: Bruce Culleton is employed by and holds stock in Baxter Healthcare. All of his input into the guidelines occurred before he joined Baxter Healthcare. Sheldon Tobe has received honoraria for academic talks for Pfizer, Bristol-Myers Squibb, Merck, Sanofi-Aventis, Amgen, Abbott, Boehringer Ingelheim, Bayer and AstraZeneca. He is involved in several contract and investigator-initiated research projects for Abbott, AstraZeneca, Pfizer, Ortho Biotech, Novartis, Bristol-Myers Squibb, Sanofi-Aventis, Amgen, Roche, Merck Frosst and Boehringer Ingelheim. Sheldon Tobe holds US and Canadian patents for a bicarbonate-buffered dialysis solution sold by Apotex/ Dialysis Solutions Inc., and he works with this company as a consultant. Philip McFarlane has been a consultant to or an advisory board member of Ortho Biotech, Amgen, Sanofi-Aventis, Bristol-Myers Squibb, Biovail, Pfizer, Novartis, AstraZeneca, Fresenius, Boehringer Ingelheim, Roche and Schering-Plough. He has received honoraria for presentations from Ortho-Biotech, Amgen, Sanofi-Aventis, Bristol-Myers Squibb, Biovail, Novartis, Abbott and Merck. Philip McFarlane has participated in or received research grant funding from Sanofi-Aventis, GlaxoSmithKline, Biovail, Boehringer Ingelheim, AstraZeneca, Ortho Biotech and Amgen. Marcel Ruzicka has received speaker's fees from Abbott, Bayer, Boehringer Ingelheim, Pfizer, Novartis, Bristol-Myers Squibb and AstraZeneca. Kevin Burns has received educational grants from Hoffman LaRoche, Bristol-Myers Squibb, Sanofi-Aventis and Pfizer Canada. Colin White is a member of a provincial advisory board for Roche for their product CERA, and the honoraria were deposited directly into an educational fund. He has performed work on a computer program for Genzyme for tracking outcome data related to calcium and phosphate metabolism. Brendan Barrett received travel assistance from AstraZeneca to attend the American Society of Nephrology annual meeting in 2007 where he presented the results of an investigator-initiated trial that was sponsored by Astra-Zeneca. Brendan Barrett has received an unrestricted educational grant from Wyeth that was used to assist trainees attend a conference of their choice. He has received speaker's fees from Merck, AstraZeneca, Pfizer and Boehringer Ingelheim for continuing medical education events. Robert Foley is a consultant for Affymax Inc. He has received speaker's fees from Amgen, Roche and Ortho Biotech. Ayub Akbari has received educational grants and speaker's fees from Boehringer Ingelheim, Sanofi and Pfizer. Martina Reslerova has received speaker's fees from Shire Pharmaceuticals and Genzyme. None declared for Adeera Levin, Brenda Hemmelgarn, Braden Manns, Francois Madore, Louise Moist, Scott Klarenbach, Kailash Jindal, Peter Senior, Neesh Pannu, Sabin Shurraw, Adam Cohn, Vinay Deved, David Mendelssohn, Gihad Nesrallah, Joanne Kappel and Marcello Tonelli. 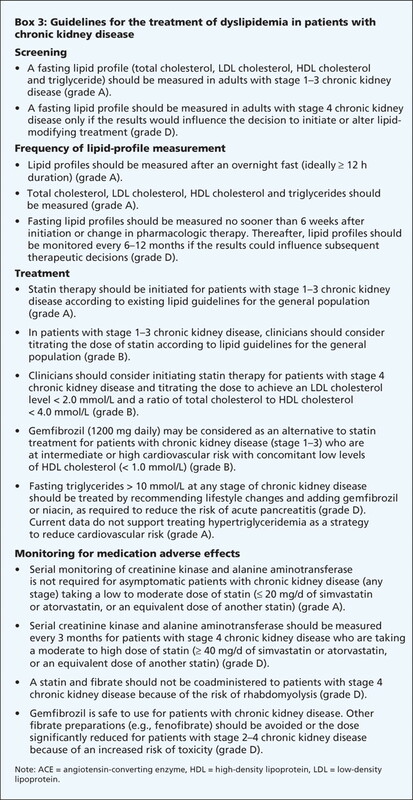 Stigant C, Stevens L, Levin A. Nephrology: 4. Strategies for the care of adults with chronic kidney disease. CMAJ 2003;168:1553-60. Go AS, Chertow GM, Fan D, et al. Chronic kidney disease and the risks of death, cardiovascular events, and hospitalization. N Engl J Med 2004;351:1296-305. Levey AS, Atkins R, Coresh J, et al. Chronic kidney disease as a global public health problem: approaches and initiatives — a position statement from Kidney Disease Improving Global Outcomes. Kidney Int 2007;72:247-59. Sarnak MJ, Levey AS, Schoolwerth AC, et al. Kidney disease as a risk factor for development of cardiovascular disease: a statement from the American Heart Association Councils on Kidney in Cardiovascular Disease, High Blood Pressure Research, Clinical Cardiology, and Epidemiology and Prevention. Circulation 2003;108:2154-69. K/DOQI clinical practice guidelines for chronic kidney disease: evaluation, classification, and stratification. Am J Kidney Dis 2002;39(Suppl 1):S1-266. Coresh J, Astor BC, Greene T, et al. Prevalence of chronic kidney disease and decreased kidney function in the adult US population: Third National Health and Nutrition Examination Survey. Am J Kidney Dis 2003;41:1-12. Stevens LA, Cooper S, Singh S, et al. Detection of chronic kidney disease in non-nephrology practices: an important focus for intervention. B C Med J 2005;47:305-11. Keith DS, Nichols GA, Gullion CM, et al. Longitudinal follow-up and outcomes among a population with chronic kidney disease in a large managed care organization. Arch Intern Med 2004;164:659-63. Zarnke KB, Campbell NR, McAlister FA, et al. A novel process for updating recommendations for managing hypertension: rationale and methods. Can J Cardiol 2000;16:1094-102. Culleton B. Introduction to the Canadian Clinical Practice Guidelines. J Am Soc Nephrol 2006;17:S1-3. Diabetes Control and Complications Trial Research Group. The effect of intensive treatment of diabetes on the development and progression of long-term complications in insulin-dependent diabetes mellitus. N Engl J Med 1993;329:977-86. UK Prospective Diabetes Study (UKPDS) Group. Effect of intensive blood-glucose control with metformin on complications in overweight patients with type 2 diabetes (UKPDS 34). Lancet 1998;352:854-65. Diabetes Control and Complications Trial and Epidemiology of Diabetes Interventions and Complications Research Group. Retinopathy and nephropathy in patients with type 1 diabetes four years after a trial of intensive therapy. N Engl J Med 2000;342:381-9. Writing Team for the Diabetes Control and Complications Trial and Epidemiology of Diabetes Interventions and Complications Research Group. Sustained effect of intensive treatment of type 1 diabetes mellitus on development and progression of diabetic nephropathy: the Epidemiology of Diabetes Interventions and Complications (EDIC) study. JAMA 2003;290:2159-67. Nathan DM, Cleary PA, Backlund JY, et al. Intensive diabetes treatment and cardiovascular disease in patients with type 1 diabetes. N Engl J Med 2005;353:2643-53. Canadian Diabetes Association Clinical Practice Guidelines Expert Committee. Canadian Diabetes Association 2008 clinical practice guidelines for the prevention and management of diabetes in Canada. Can J Diabetes 2008;32(Suppl 1):S1-S201. Donnelly LA, Doney AS, Hattersley AT, et al. The effect of obesity on glycaemic response to metformin or sulphonylureas in type 2 diabetes. Diabet Med 2006;23:128-33. Salpeter S, Greyber E, Pasternak G, et al. 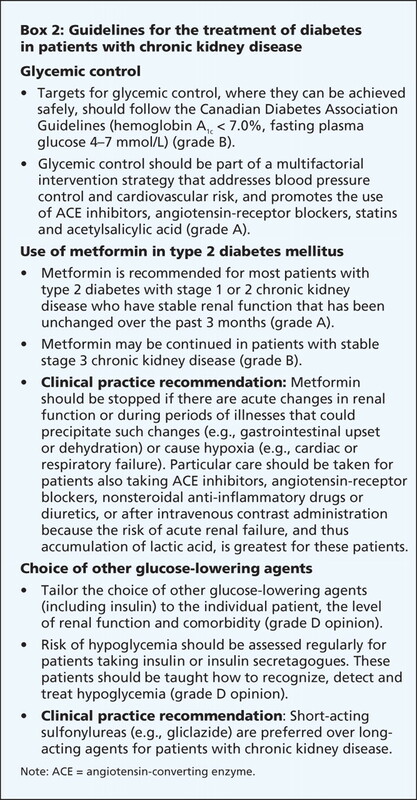 Risk of fatal and nonfatal lactic acidosis with metformin use in type 2 diabetes mellitus. Cochrane Database Syst Rev 2006;(1):CD002967. Lalau JD, Race JM. Lactic acidosis in metformin therapy: searching for a link with metformin in reports of “metformin-associated lactic acidosis”. Diabetes Obes Metab 2001;3:195-201. Kasiske BL. Hyperlipidemia in patients with chronic renal disease. Am J Kidney Dis 1998;32(Suppl 3):S142-56. McPherson R, Frohlich J, Fodor G, et al. Canadian Cardiovascular Society position statement — recommendations for the diagnosis and treatment of dyslipidemia and prevention of cardiovascular disease. Can J Cardiol 2006;22:913-27. Sever PS, Dahlof B, Poulter NR, et al. Prevention of coronary and stroke events with atorvastatin in hypertensive patients who have average or lower-than-average cholesterol concentrations, in the Anglo-Scandinavian Cardiac Outcomes Trial– Lipid Lowering Arm (ASCOT–LLA): a multicentre randomised controlled trial. Lancet 2003;361:1149-58. Tonelli M, Isles C, Curhan GC, et al. Effect of pravastatin on cardiovascular events in people with chronic kidney disease. Circulation 2004;110:1557-63. Wanner C, Krane V, Marz W, et al. Atorvastatin in patients with type 2 diabetes mellitus undergoing hemodialysis. N Engl J Med 2005;353:238-48. Saltissi D, Morgan C, Rigby RJ, et al. Safety and efficacy of simvastatin in hypercholesterolemic patients undergoing chronic renal dialysis. Am J Kidney Dis 2002;39:283-90. Baigent C, Landray M, Leaper C, et al. First United Kingdom Heart and Renal Protection (UK-HARP-I) study: biochemical efficacy and safety of simvastatin and safety of low-dose aspirin in chronic kidney disease. Am J Kidney Dis 2005;45:473-84. Klahr S, Levey AS, Beck GJ, et al. The effects of dietary protein restriction and blood-pressure control on the progression of chronic renal disease. Modification of Diet in Renal Disease Study Group. N Engl J Med 1994;330:877-84. Kasiske BL, Lakatua JD, Ma JZ, et al. A meta-analysis of the effects of dietary protein restriction on the rate of decline in renal function. Am J Kidney Dis 1998;31:954-61. Touyz RM, Campbell N, Logan A, et al. The 2004 Canadian recommendations for the management of hypertension. Part III: Lifestyle modifications to prevent and control hypertension. Can J Cardiol 2004;20:55-9. Khan NA, McAlister FA, Rabkin SW, et al. The 2006 Canadian Hypertension Education Program recommendations for the management of hypertension. Part II: Therapy. Can J Cardiol 2006;22:583-93. Jafar TH, Stark PC, Schmid CH, et al. Proteinuria as a modifiable risk factor for the progression of non-diabetic renal disease. Kidney Int 2001;60:1131-40. Gerstein HC, Mann JF, Yi Q, et al. Albuminuria and risk of cardiovascular events, death, and heart failure in diabetic and nondiabetic individuals. JAMA 2001;286:421-6. Keane WF, Eknoyan G. Proteinuria, albuminuria, risk, assessment, detection, elimination (PARADE): a position paper of the National Kidney Foundation. Am J Kidney Dis 1999;33:1004-10. Beetham R, Cattell WR. 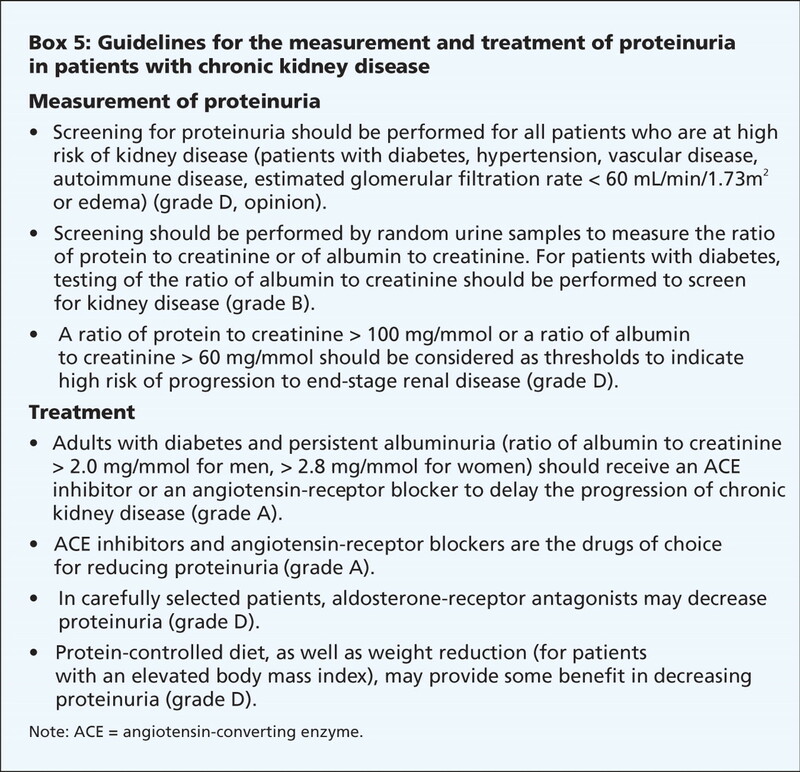 Proteinuria: pathophysiology, significance and recommendations for measurement in clinical practice. Ann Clin Biochem 1993;30:425-34. Ruggenenti P, Perna A, Gherardi G, et al. Renoprotective properties of ACE-inhibition in non-diabetic nephropathies with non-nephrotic proteinuria. Lancet 1999;354:359-64. Gansevoort RT, Sluiter WJ, Hemmelder MH, et al. Antiproteinuric effect of blood-pressure-lowering agents: a meta-analysis of comparative trials. Nephrol Dial Transplant 1995;10:1963-74. 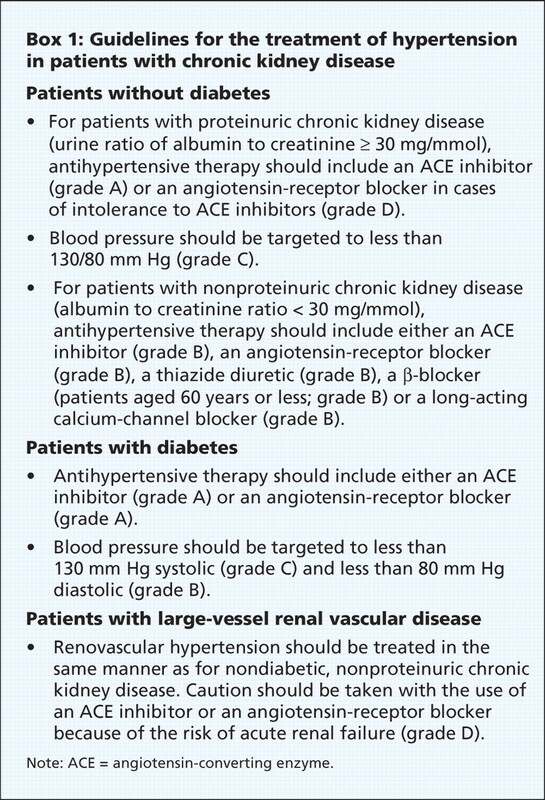 ACE inhibitors in Diabetic Nephropathy Trialist Group. Should all patients with type 1 diabetes mellitus and microalbuminuria receive angiotensin-converting enzyme inhibitors? A meta-analysis of individual patient data. Ann Intern Med 2001;134:370-9. Parving HH, Lehnert H, Brochner-Mortensen J, et al. The effect of irbesartan on the development of diabetic nephropathy in patients with type 2 diabetes. N Engl J Med 2001;345:870-8. Effects of dietary protein restriction on the progression of moderate renal disease in the Modification of Diet in Renal Disease Study. J Am Soc Nephrol 1996;7:2616-26. Morales E, Valero MA, Leon M, et al. Beneficial effects of weight loss in overweight patients with chronic proteinuric nephropathies. Am J Kidney Dis 2003;41:319-27. GISEN Group (Gruppo Italiano di Studi Epidemiologici in Nefrologia). Randomised placebo-controlled trial of effect of ramipril on decline in glomerular filtration rate and risk of terminal renal failure in proteinuric, non-diabetic nephropathy. Lancet 1997;349:1857-63. Ruggenenti P, Perna A, Gherardi G, et al. Renal function and requirement for dialysis in chronic nephropathy patients on long-term ramipril: REIN follow-up trial. Gruppo Italiano di Studi Epidemiologici in Nefrologia (GISEN). Ramipril efficacy in nephropathy. Lancet 1998;352:1252-6. 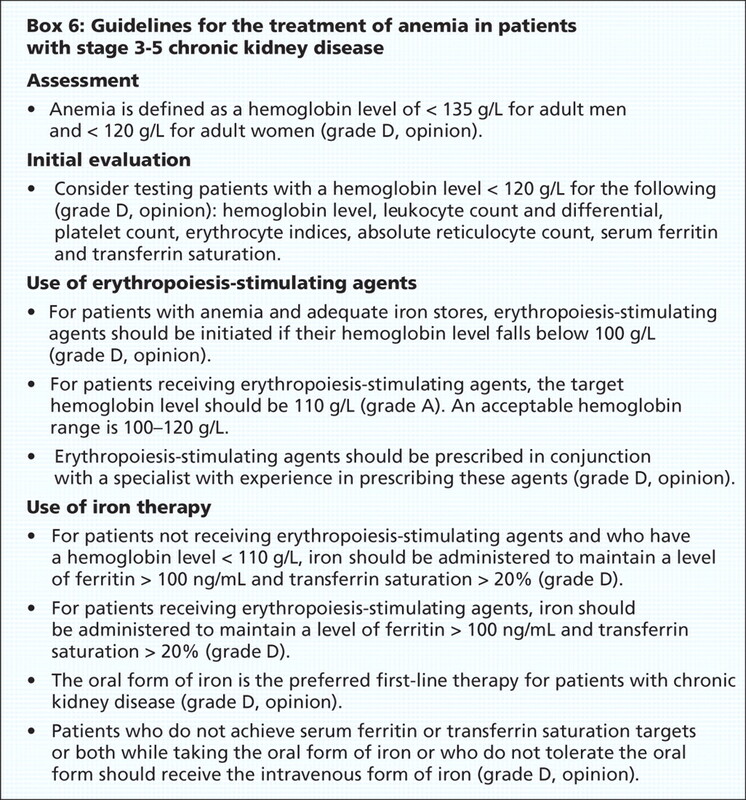 K/DOQI clinical practice guidelines and clinical practice recommendations for anemia in chronic kidney disease. Am J Kidney Dis 2006;47(Suppl 3):S11-145. Culleton BF, Manns BJ, Zhang J, et al. Impact of anemia on hospitalization and mortality in older adults. Blood 2006;107:3841-6. Jurkovitz CT, Abramson JL, Vaccarino LV, et al. Association of high serum creatinine and anemia increases the risk of coronary events: results from the prospective community-based atherosclerosis risk in communities (ARIC) study. J Am Soc Nephrol 2003;14:2919-25. Drueke TB, Locatelli F, Clyne N, et al. Normalization of hemoglobin level in patients with chronic kidney disease and anemia. N Engl J Med 2006;355:2071-84. Singh AK, Szczech L, Tang KL, et al. Correction of anemia with epoetin alfa in chronic kidney disease. N Engl J Med 2006;355:2085-98. Phrommintikul A, Haas SJ, Elsik M, et al. Mortality and target haemoglobin concentrations in anaemic patients with chronic kidney disease treated with erythropoietin: a meta-analysis. Lancet 2007;369:381-8. Charytan C, Qunibi W, Bailie GR. Comparison of intravenous iron sucrose to oral iron in the treatment of anemic patients with chronic kidney disease not on dialysis. Nephron Clin Pract 2005;100:c55-62. Van Wyck DB, Roppolo M, Martinez CO, et al. A randomized, controlled trial comparing IV iron sucrose to oral iron in anemic patients with nondialysis-dependent CKD. Kidney Int 2005;68:2846-56. Tonelli M, Sacks F, Pfeffer M, et al. Relation between serum phosphate level and cardiovascular event rate in people with coronary disease. Circulation 2005;112: 2627-33. Kestenbaum B, Sampson JN, Rudser KD, et al. Serum phosphate levels and mortality risk among people with chronic kidney disease. J Am Soc Nephrol 2005;16:520-8. Block GA, Klassen PS, Lazarus JM, et al. Mineral metabolism, mortality, and morbidity in maintenance hemodialysis. J Am Soc Nephrol 2004;15:2208-18. Martinez I, Saracho R, Montenegro J, et al. The importance of dietary calcium and phosphorous in the secondary hyperparathyroidism of patients with early renal failure. Am J Kidney Dis 1997;29:496-502. Manns B, Stevens L, Miskulin D, et al. A systematic review of sevelamer in ESRD and an analysis of its potential economic impact in Canada and the United States. Kidney Int 2004;66:1239-47. Meier-Kriesche HU, Kaplan B. Waiting time on dialysis as the strongest modifiable risk factor for renal transplant outcomes: a paired donor kidney analysis. Transplantation 2002;74:1377-81. Mange KC, Joffe MM, Feldman HI. Effect of the use or nonuse of long-term dialysis on the subsequent survival of renal transplants from living donors. N Engl J Med 2001;344:726-31. Wolfe RA, Ashby VB, Milford EL, et al. Comparison of mortality in all patients on dialysis, patients on dialysis awaiting transplantation, and recipients of a first cadaveric transplant. N Engl J Med 1999;341:1725-30. Allon M, Lockhart ME, Lilly RZ, et al. Effect of preoperative sonographic mapping on vascular access outcomes in hemodialysis patients. Kidney Int 2001;60:2013-20. Jindal K, Chan CT, Deziel C, et al. Hemodialysis clinical practice guidelines for the Canadian Society of Nephrology. J Am Soc Nephrol 2006;17(Suppl 1):S1-27. Culleton BF, Walsh M, Klarenbach SW, et al. Effect of frequent nocturnal hemodialysis vs conventional hemodialysis on left ventricular mass and quality of life: a randomized controlled trial. JAMA 2007;298:1291-9. National Consensus Project for Quality Palliative Care. Clinical practice guidelines for quality palliative care. Brooklyn (NY): The Project; 2004. Main J, Whittle C, Treml J, et al. The development of an integrated care pathway for all patients with advanced life-limiting illness — the Supportive Care Pathway. J Nurs Manag 2006;14:521-8. Perry E, Swartz J, Brown S, et al. Peer mentoring: a culturally sensitive approach to end-of-life planning for long-term dialysis patients. Am J Kidney Dis 2005;46:111-9. Davison SN, Torgunrud C. The creation of an advance care planning process for patients with ESRD. Am J Kidney Dis 2007;49:27-36.